When I look at a fascinating cover on any recording it makes me feel like we are getting off to a good start. 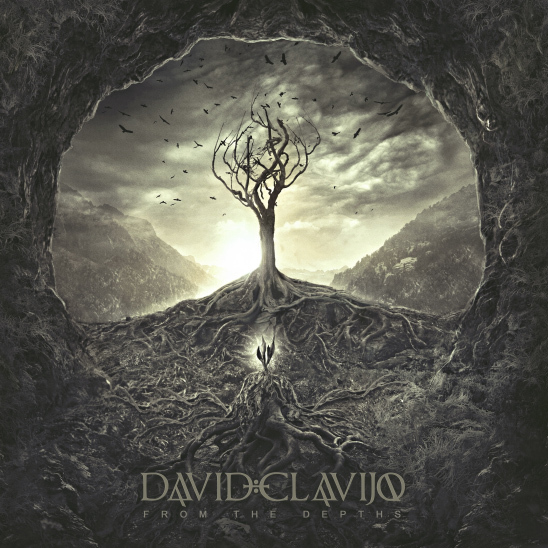 But almost as soon as that thought goes through my mind it leaves and the questions pops in “Will the music be representative of the art or anywhere as compelling as the cover art?” The answer to that question lies in the 11 tracks on the latest David Clavijo recording titled From the Depths. The final answer to the equation is a resounding yes! This is a fine recording with a lot of different colors and textures for all the senses to absorb and process. Anyone seeking a listening challenge would welcome the prospect of an eclectic listen such as this. I think “Fragile World (feat. Laura Powers)” is a prolific track. First and foremost is the meaning of the song. It has the power to compel a listener to think outside the box. That is the best circumstance for any artist trying to get your attention. And with that it gives us impetus to pay more attention to the world we live in. It also is very different from all the preceding instrumental tracks. The title track is critical to any recording, it sets the tone for the entire album actually and either opens or closes the door on many listeners. I look at every album as an open book ready to flip through the pages and some I go back to again for another chance in the event there was any doubt. This is my process however that thought of doubt never occurred to me on this listen. The opening title track was different enough to grab my attention. I heard world, rock, new age and a tone that distinctly was coming from inspirations of our Native Americans. A lot of New Age music features the earthy tones and this album is full of them. “Sitting On The Sea Wall” is another step away from the norm. Clavijo is from Spain and this track is the sound of his land peppered with smooth saxophone to open things up then a very distinct flavoring of guitar picking that puts you right in that beautiful country. I also took note of the tremendously infectious percussion that was quite appropriate for finishing the picturesque tune. It sounds like it would be the perfect accompaniment to a scene in a movie. It ends with sounds of seagulls on the shoreline, a perfect closing for a beautiful picture painted with a broad musical brush. As the saying goes variety is the spice of life and From the Depths is as spicy as it gets from a musical standpoint. From a multitude of instruments to angelic vocalizations, this recording will please your ear, satisfy your soul and leave you hungry for more. That is the whole idea so mission accomplished for Mr.Clavijo (Viva! ).